By tradition, this bed is linked to Queensbury in West Yorkshire, about three and a half miles south-west of Bradford. In the 17th century this area was very prosperous, because the woollen spinning and weaving trades were thriving and furniture makers developed a strongly local tradition of decoration that included the carved diamonds or lozenges that you can see on the panels of this bed. The tulips, which embellish the lozenges, were also a popular motif, fashionable just a few decades after they had become so popular when they were first imported into Europe. By the seventeenth century, it was usual for beds of any reasonable status to have a solid wooden 'tester' or top, in place of the panels of textile that were used in medieval times. West Yorkshire was traditional in its taste for ornament, and the same designs were produced over a long period, so it is likely that this bed, in fact, dates from about 1680. A bed of carved oak, with inlay of holly and bog oak. The bed consists of a full height panelled bedhead and footboard, joined by two rails and a panelled tester. 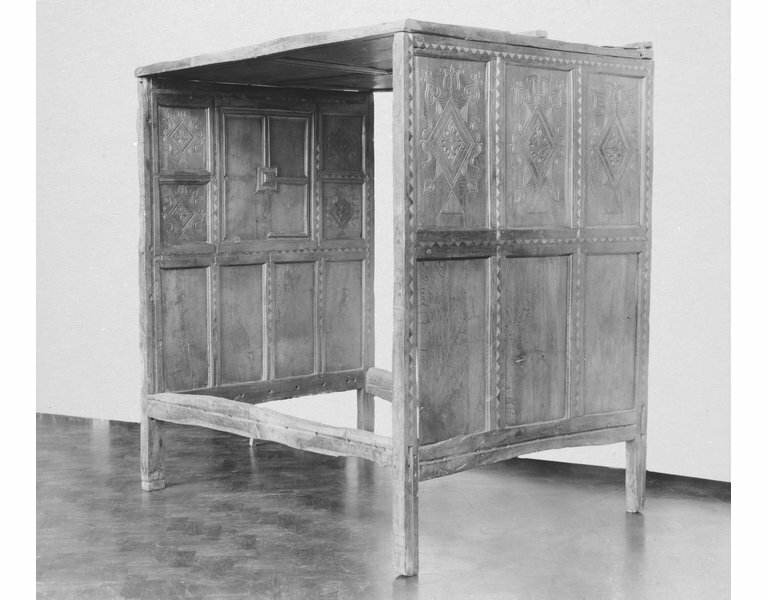 The headboard shows a lower tier of four plain panels, surmounted by a central large, almost square panel, flanked by a double rank of almost square panels to both sides. The central panel is subdivided into four, with a square boss at the centre. The lower panels are plain, the upper, outer panels are shallowly carved with lozenges, with outer scrolls running into tulip heads. The framing sections are inlaid with alternate triangles of holly and bog oak. 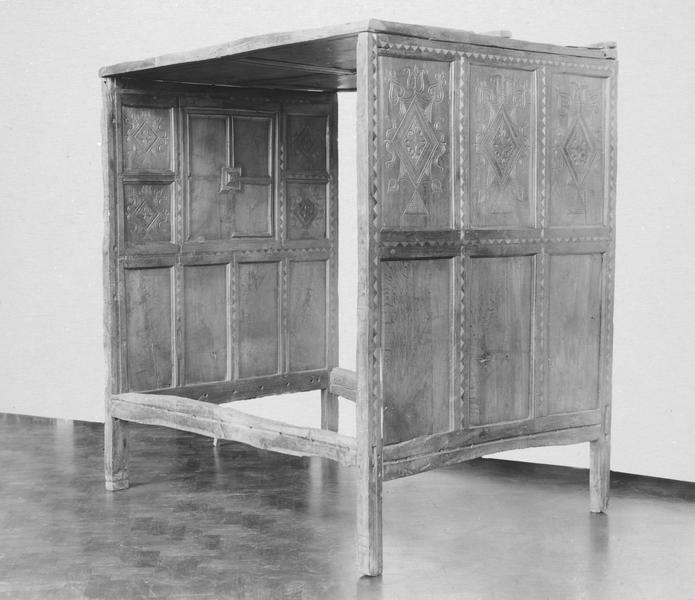 The footboard shows two tiers of panels, with three on each tier, the upper ones only decorated on the foot face with similar lozenges and the framing similarly inlaid. The two rails that join the headboard and footboard are of uneven shape, with waney edges (where the rail over-runs the natural edge of the tree) and are pierced for roping to support the mattress, as are the lower rails of both the footboard and the headboard. This bed was purchased by the Museum in 1914 from Edward M. Carter of Croydon, for £20 (Registered papers 14/1916. At that time it was recorded as 'worn and cracked; part of the inlay missing'. The bed was said to have come from Queensbury, a small village, about three and a half miles to the south west of Bradford. In the 17th century, the West Riding of Yorkshire was very prosperous as a result of the thriving woollen cloth industry and there were several important centres of furniture making, in Leeds, Bradford, Halifax and, probably, in smaller towns and villages. The use of the lozenge or diamond as a motif for decorating the panels was popular in both Yorkshire and parts of Lancashre. The tulip became a popular and fashionable motif in the second half of the 17th century. The quality of this bed is show by the fact that the frame sports strongly contrasting (white and black) inlay in holly and bog oak (oak which had been submerged for centuries and had turned a deep black). By the seventeeth century, it had become common for beds to have a wooden tester or top panel, rather than the textile panels that had been general in the medieval period. A bed of carved oak, with inlay of holly and bog oak. The bed consists of a full height panelled bedhead and footboard, joined by two rails and a panelled tester. Chinnery, Victor: Oak Furniture. The British Tradition. Revised edition. Woodbridge: ACC Art Books, 2016, p. 353, fig. 3:463. The bed had been illustrated in the first edition (1979), p. 390, fig. 3:463. 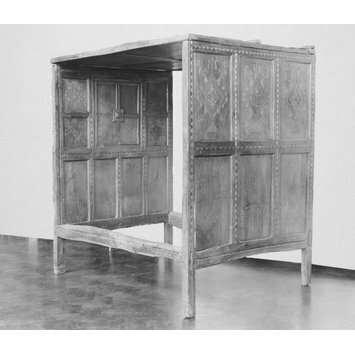 Cescinsky, Herbert and Ernest Gribble, Early English Furniture and Woodwork. II vols. London: Waverley Book Co., 1922, vol. I, p. 360, fig. 393.